The Brown Trout Season has started well for the anglers of the UAAA. 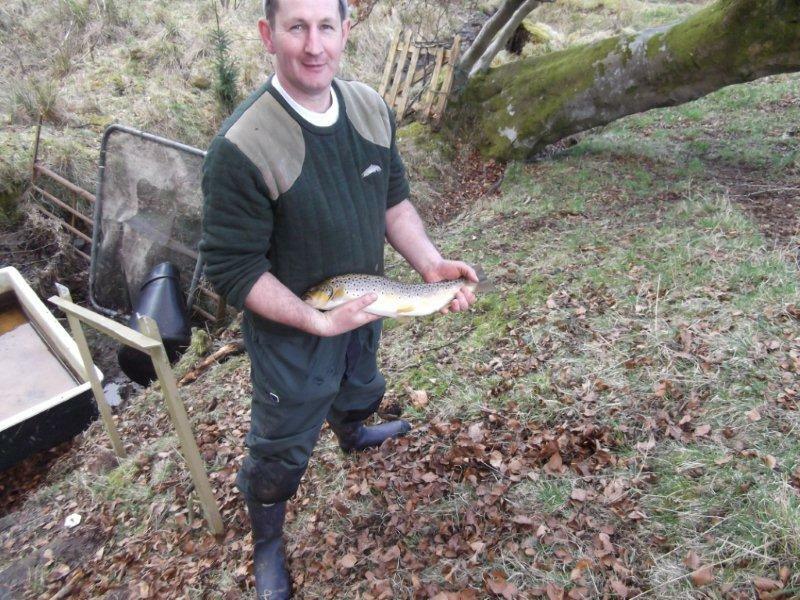 The warm weather at the start to the Brown Trout Season (March the 15th) meant that the Trout fishing started early on Glengavel Reservoir & the River Avon with many good quality Trout being caught. Davy Learmouth & Davy Baxter have reported some excellent catches from the River. 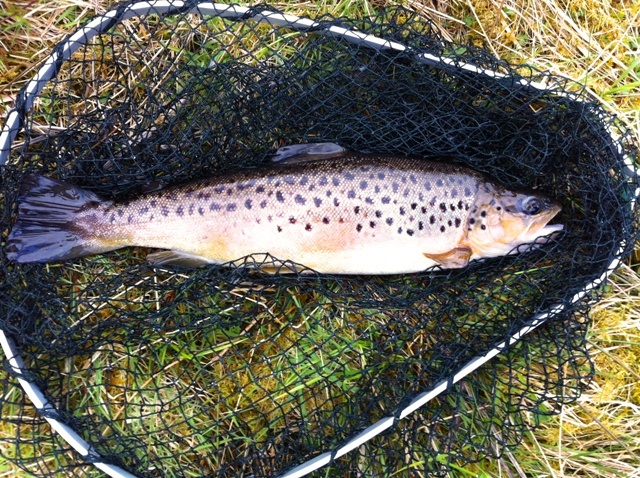 Catch of the day this fine specimen of Brownie was landed & returned at Glengavel on Saturday the 14th despite a harsh north easterly wind and a few fluries of snow flakes. It took a GB Gold Ribbed Hares Ear Nymph. I’m reliably informed that the best all round flies for the Avon all year round are – Blue Dun, Black Spider, Pheasant Tail Nymph & Gold Ribbed Hares Ear. Though i think i’d be tempted to add to that Greenwells Glory, Snipe & Purple & Orange & Partridge. We are keen to make everyone aware that our permits are available for the River in a number of local outlets & at only £10.00 a year it’s great value for money & kids under 13 can obtain permits free of charge as we want to help to encourage the anglers of the future. It is our pleasure to announce that we will again be running an open team competition on Saturday 19th of May 2012. This year once again we hope that the weather gods will for once shine on us & we don’t have to fish in either “Hurricane Dungavel” or a “flat glassy calm & bright sunshine” – what are the odds? For more info please check out our post – UAAA Annual Team Competition 19th of May 2012. The Association are also keen to report that they have been very active over the past few weeks carrying out a number of tasks on the River & Loch including putting up new signs in many areas & posting up some improved maps for the anglers which are available on the clubs website www.upperavonangling.co.uk you will find them under Angler Info and then scroll down to Maps. The Maps are there to help our anglers find point of access to the river. 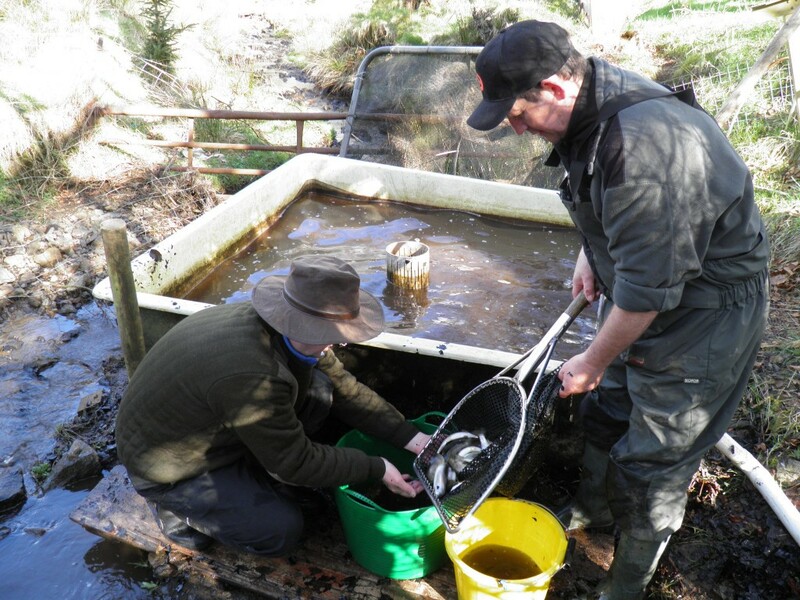 There also has been a lot of activity at the UAAA’s Hatchery & Rearing Ponds – this project is unique in Scotland in that Local Indigenous Brown Trout are stripped & grown on to be stocked thus preserving the integrity of the local trout. 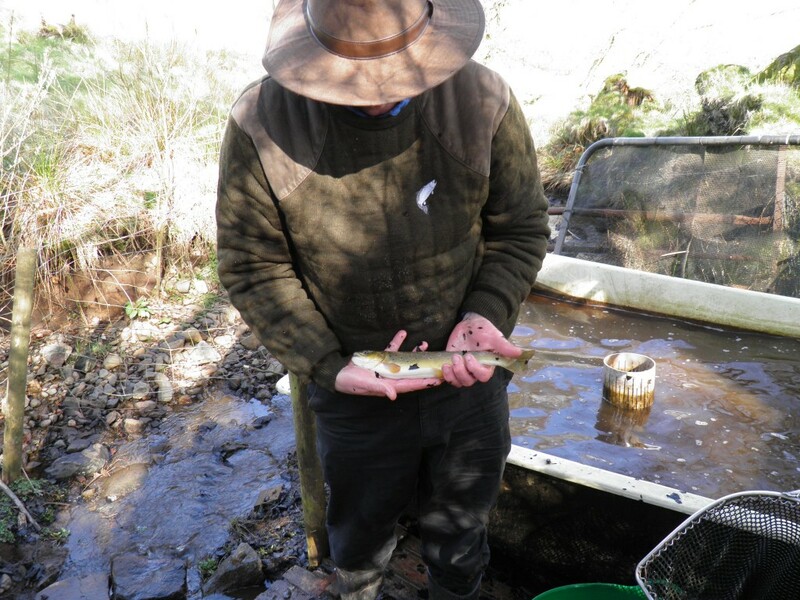 A number of Trout were trickle stocked into the River over the past few weeks of around 1 lb up to 4lbs by our hardy bunch of volunteers & Committee members. Graeme, Wullie, Brian & Alex were busy emptying the 1 year pond & moving these fish into the 2 year pond on Saturday the 14th – have enclosed 2 photos below – the first one shows the fish being counted and ready to go into there new home & the second shows a Trout which has outsripped it’s brothers & sisters in the growth stakes. Graeme & Wullie counting the yearlings. Graeme holds our extraordinarily big yearling? Just keen to let you all see the hardwork that is constantly going on in the background trying to provide quality fishing for all our members. 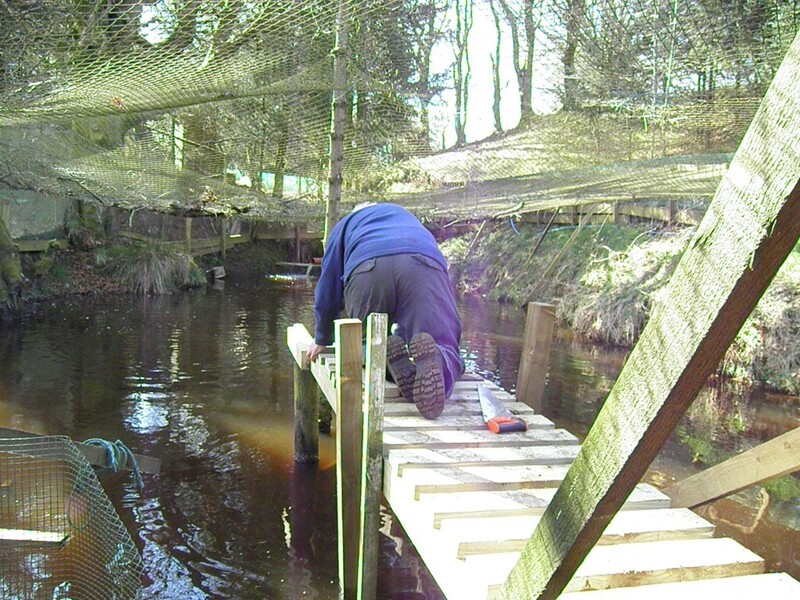 Here is also a photo of Jim hard at work on Saturday morning buiding a new walkway in the 2 year pond. Jim working hard building a walkway in the 2 year pond. Please see below a short video of some Trout being fed in one of our ponds on Saturday morning. We also had a party of seven anglers from Prestwick fishing at Glengavel – hope you had a great day.